Snivy has a bright green head, torso and tail, a cream coloured belly and chin and bright yellow detail around his eyes and neck. He has embroidered brown and white eye detail on his face and small black nostrils. 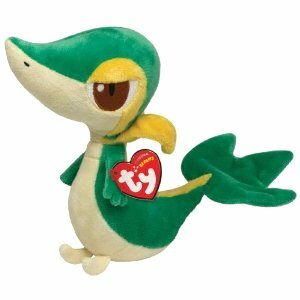 Snivy was introduced along with five other Pokemon Beanie Babies in October 2011, the others being Pikachu, Oshawott, Tepig, Axew and Pansage.